You cannot trust your mobile maps in the labyrinth of Shahjanabad, especially if you have to find Gali Qasam Jaan. This is the narrow lane where Mirza Ghalib spent his last 9 years. This is also the place (Balimaran) where on some terrace, one of my favorite Ghazal – ‘Chupke Chupke Raat Din’ was composed. Though I would have loved to visit that terrace but not much is known about it. 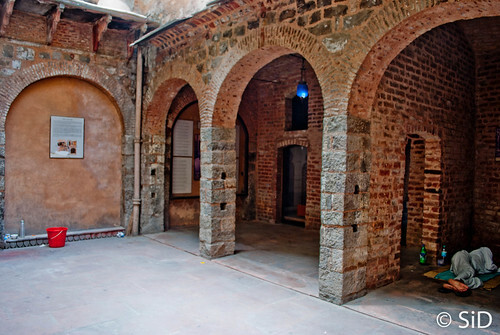 What is known though is the Haveli where Ghalib spent his last years. The word Haveli springs images of grandeur – perhaps a huge mansion with many rooms, gardens, fountains etc. But this haveli of a space constrained Old Delhi is a bit different. You enter the ancient doors onto a pathway. There is a small, partially covered yard at the end of this small pathway and one room to the right of it. But it is certainly grand compared to the rest of the houses around and in its time would definitely have been an awesome place. 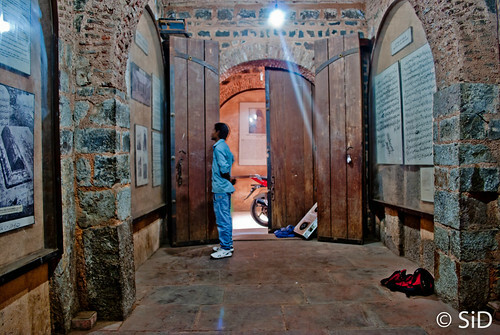 Imagine Ghalib sitting there in the yard, in his own dreamy world, writing words which would take him to an enviable place in history. 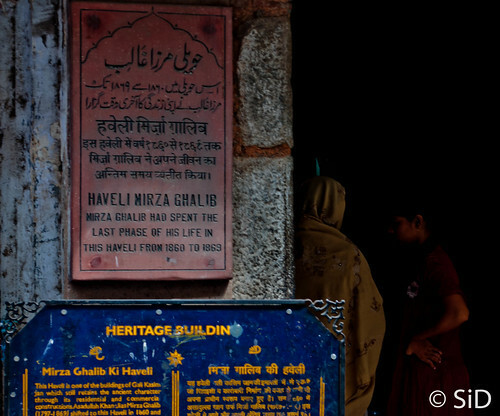 Presently, this Haveli has been converted into a mini museum with Ghalib’s writings, photos and even a sculpture in an attempt to build his lifestyle there. The timings are 10 to 5 and entry is free so it’s worth a visit if you are around shopping near Chandni Chowk. 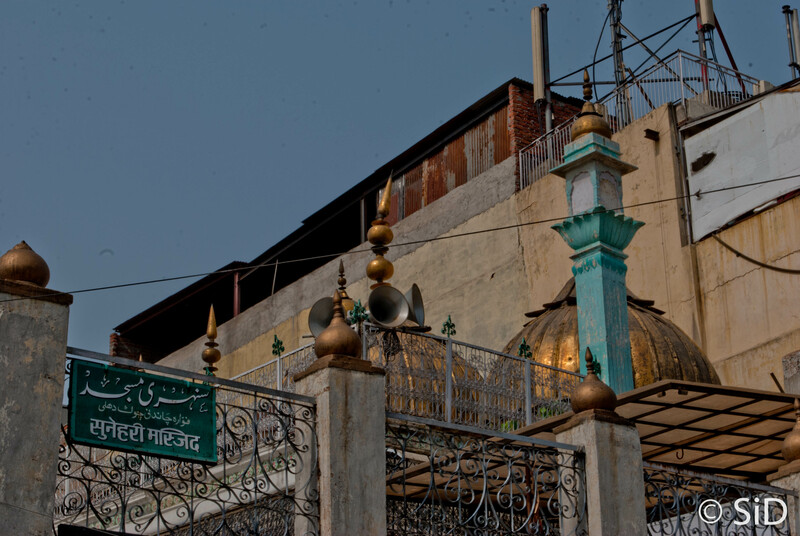 There are two Sunheri Masjids – both in Old Delhi. One, built in 1751 is just outside the Red Fort. Its ‘sunherapan’, which it got from copper gilded domes, has long gone. The other one, built 30 years earlier in 1721 is on Chandni Chowk – next to Sees Ganj Gurudwara. Unlike its younger counterpart, this one still retains the golden colored domes though they are in a pretty bad shape as is the rest of the mosque. Had it not been the golden touch, it would easily merge with the rest of the buildings and be ‘just another mosque’ which it actually is not. The Sunheri masjid, which stands on a balcony with shops beneath, has been known for some wrong reasons in the past. The mosque was built by Roshan-ud-dualah, the treasurer of Mughal King Mohammed Shah. Roshan-ud-dualah, it is alleged was a notorious bribe taker. Then later in 1739, Nadir Shah invaded Delhi. After the defeat, Mughals invited him to Delhi. All was fine till his men murdered some cows as a sacrifice. Religion has always been a sensitive spot in the Indian mentality. Slowly the matter snow balled and many of his men were killed. It was escalated when a rumor starting floating that Nadir Shah was poisoned. He then came out to see what was happening. Facing hostilities on Chandni Chowk he dismounted and went up the Sunheri masjid. Here an attempt on his life was made when someone fired a bullet. All this angered him and, he ordered a mass massacre of Delhi. As Mr. Shah sat watching on the balcony, around 30,000 people were killed through the night. Some historians say the number was 120,000. In any case it is counted as one of the bloodiest slaughters in the world. A visit to Chandni Chowk is an out of Delhi experience – the Delhi that is experienced in a normal routine with flyovers after flyovers, broad (but still jammed) roads, duplicate malls where once inside its tough to tell which part of the country you are in. That is the New Delhi. Chandni Chowk is different. 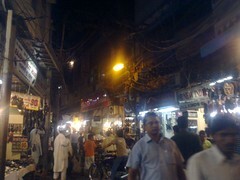 Its Old Delhi. And if the makers of movie Delhi-6 felt that their portrayal would help us get a glimpse of the experience of Chandni Chowk, they were completely wrong. You have to be here to really experience it. In a movie you can only see a part of it. You are not able to feel the people & rickshaws grazing you, smell that unmatchable aroma of kababs, see kilometeres of wires intertwined beyond comprehension such that no one even attempts to touch them, taste the original mughlai dishes at Kareem’s and hear the rickshaw walas continuously shouting in an attempt to clear the way which even one person is sufficient to block. My Delhi-6 experience started in company of Amit when we got off near the Old delhi railway Station Opposite the massive Red Fort. 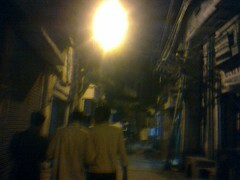 We walked, trying to find way towards Chandni Chowk area and utlimately the final destination – Kareems. A turn and after walking some distance we found ourselves facing Sheesh Ganj Gurudwara. I remembered it from childhood when once I had been to this gurudwara where Guru Teg Bahadur had finally fallen after carrying his decapitated head in his hands from Red Fort. 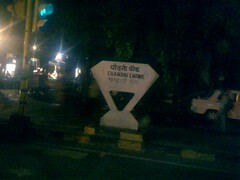 We randomly walked soaking in the feel of the famous Chandni Chowk. Chandni Chowk was developed by Jahanara Begumm – daughter of Shah Jahan when he moved his court from Agra to Delhi after his wife’s death. It is essentially a street – the principal avenue of the Old City. Something like Shahjanabad’s ‘Brigade Road’- a boulevard with shops on either side. It may have been the attraction of the town in its hey days but now it is a definition of chaos. I tried to find some method to the madness but could find none. Though the place still has the archaic feel to it but there are islands of modernity. There are ‘Outlaw’ brands interspersed between the traditional ‘Asharfian’ and several other ‘cloth houses’. Among the many Burqa clad women, sometimes you spot young girls with bright clothes & i-pod in ears. A shining clean, vegetarian Haldirams stands among the numerous dirty roadside, completely non-vegeterian shops. We turned left in a small gali which had endless shops of footwear shops. But the space for footwear was only on walls of the shops. On road, 2 rickshaws grazed by if they had to cross each other. 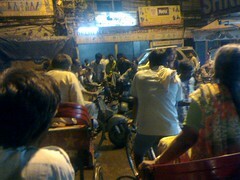 The rickshawallahs repeatedly called out to people walking in front to make their way. It was them or us or may be us on them!! we carried on through the small alleys. There was some apprehension to go on when the alley suddenly turned dark. But it was an interesting decision to go on. The setting remained the same but the name, owners and the contents at the shops changed completely. The turbaned heads were in prominence near Sheesh Ganj, then people in white, embordieried skull caps appeared manning their leather footwear. And now suddenly out of no where we could see a ‘Sri Ganga Temple’ and shops named Laxmi, Saraswati, Durga – all selling wedding cards. By now tired, having no idea where we were headed and Ovi Maps failing in these labyrinths we took a rickshaw and gave him responsibility to make our hungry tummys reach their destination – Kareems – the famous Time Magazine featured ‘dhaba’. As we neared the end of the narrow alley we found a truck attempting to enter it – a truck in a place where rickshaws were barely able to make their way. We defintely believe in the statement ‘impossible is nothing’ as far as driving is concerned. Soon the massive Jama Masjid came into view. A big bazar with only resturants stood adjoining it. And between the hanging chicken – raw and roasted and smell of kababs sat Kareems – the neatly organised and overflowing with people struggling, waiting and cajoling the waiters to get their seats. Ancestors of the owners worked as chefs in the royal kitchens of Mughal Emperors. 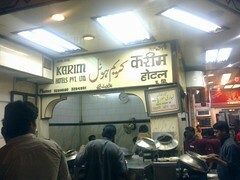 The present owner’s great grandfather Haji Karimuddin, who served in the kitchen of Bahadur Shah Zafar, then decided to bring the royal delicacies to the masses after the Mughals era ended. Seeing the menu there you know that why these Mughal rajas were like tall, broad shouldered, meaty hunks or you may call them ‘Hulks’. Kareem Hotel – well not exactly a Hotel! We had to share table with couple of other people but it was all worth the wait and the walk. Seekh Kabab was nice and juicy, mutton was the best I have ever had. The chicken, though immersed in oil was good, the roti very very heavy and the kheer was tasted after long time. After the chandni chowk walk and a heavy dinner, nothing except sleep was on mind! ShahJahan would have retired to his Bedroom at the Fort across the road but we had to take a long journey back where Delhi suddenly turned new as soon as we crossed the Delhi Gate. Its tough to find this inconspicuous gate on a map. The Mughal era map of Old Delhi shows this gate to the south of walled city which once was a passage out of the city. Now, though it seems like an obstruction between the passages.